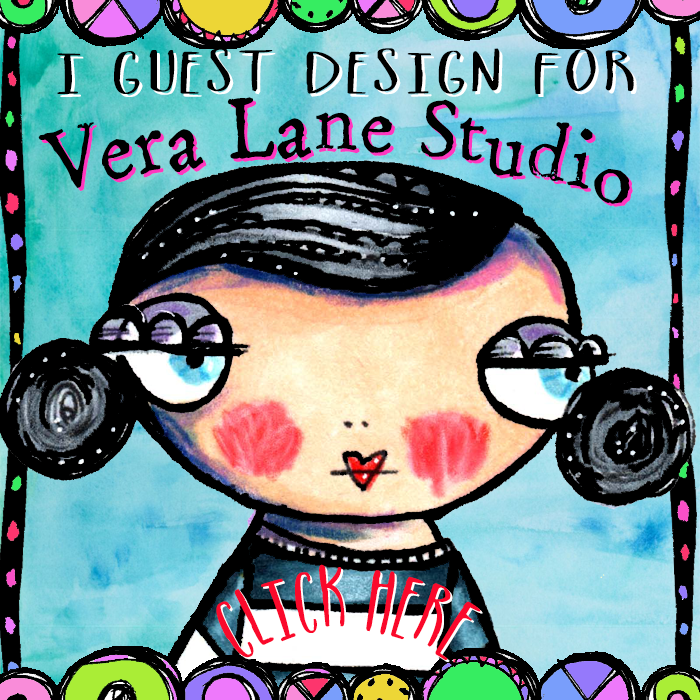 Vera Lane Studio is a happy place. The street is filled with whimsy and sunshine. 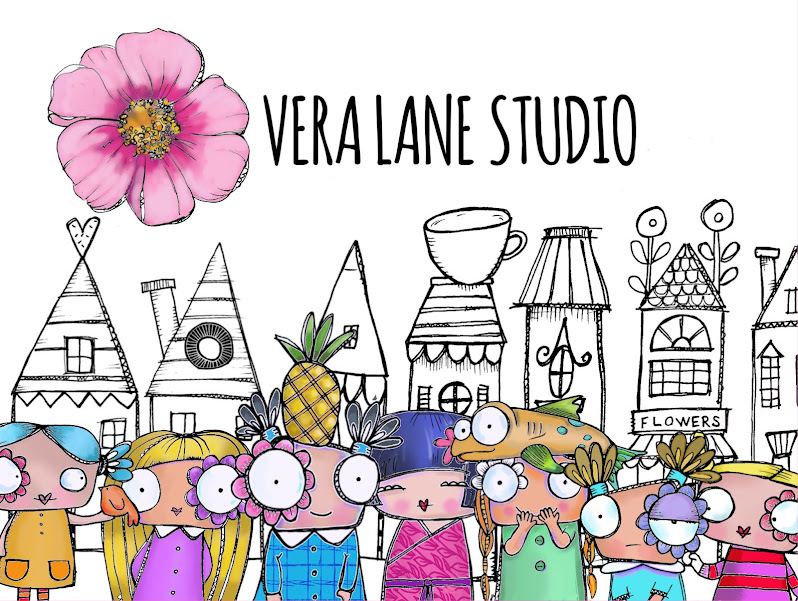 Here's a sweet little set to be used alone or combine with some of the characters from Vera Lane. 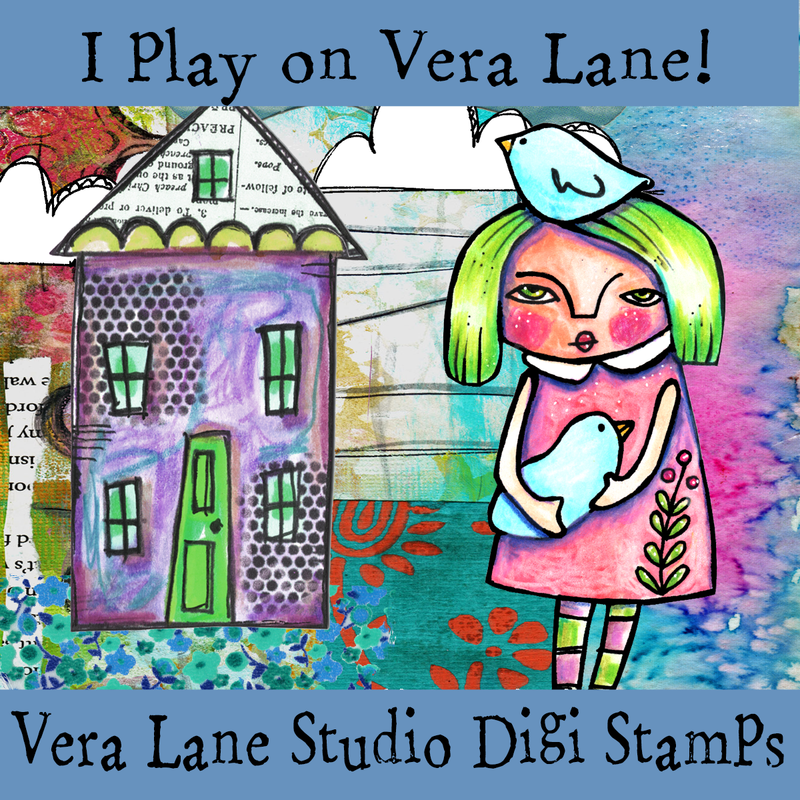 Bud and birds as all Vera Lane digi sets is quite versatile for all your paper crafting. Resize, flip, rotate, stretch. Use them together all alone for cards, thank yous, invites, journal pages, tags and more. ﻿﻿Buds and birds, part of a growing collection of quirky and whimsical digi stamps can be found in my Etsy shop. The loose and sketchy line nature of this hand-drawn art can be incorporated into your art for a unique and original look. The Stampotique Designer's Challenge SDC 149 was put out this week by design team member Sam Read. Sam was calling for creations using pink, turquoise and polka dots. I had created my background a few days ago using two shades of aqua acrylic over some lime. I created loose dots with Peerless watercolors and scribble white water-based Sharpies and graphite pencil to accent. I applied pink acrylic paint through sequin waste to add polka dots. This morning's news brought of the passing of national treasure, author and activist Maya Angelou. "I know why the caged bird sings" was Angelou's international best seller nominated for the National Book Award. 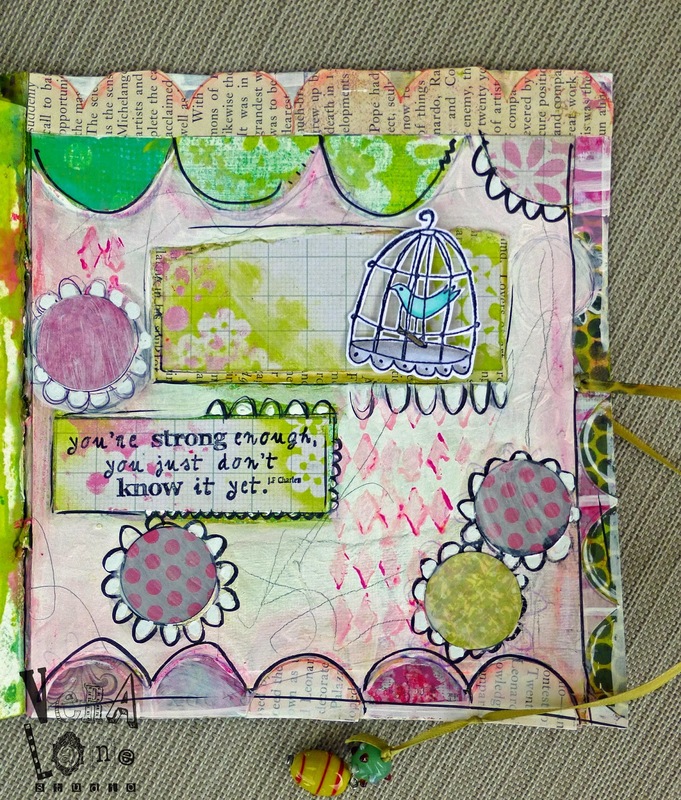 I decided to use these two Stampotique images; Bird Cage by France Papillon and a portion of Birdy Up by Kida Nichols. 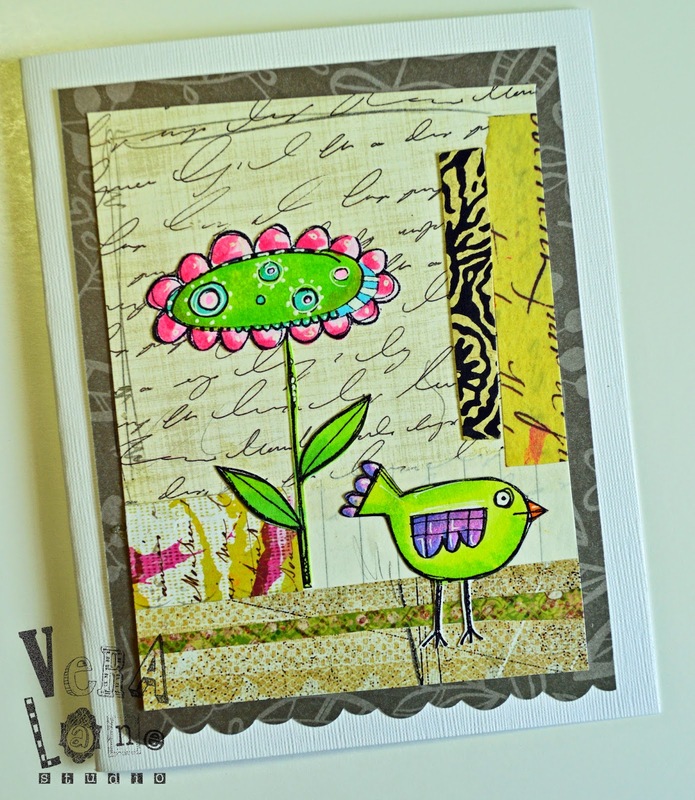 The birdy was stamped and embossed, colored with COPICS, fussy cut and glued to background. The bird cage was stamped over the bird with Stazon and embossed. Because this layout lacks the seriousness of it's title, I thought I would leave it free of text to be my silent tribute. A once homeless and a teen mother, Angelou commitment to civil rights and artistic work has made her a truly phenomenal woman of our time. You can read her elegant poem, Phenomenal Women by clicking the highlighted link. My " background pile" was calling me this morning. 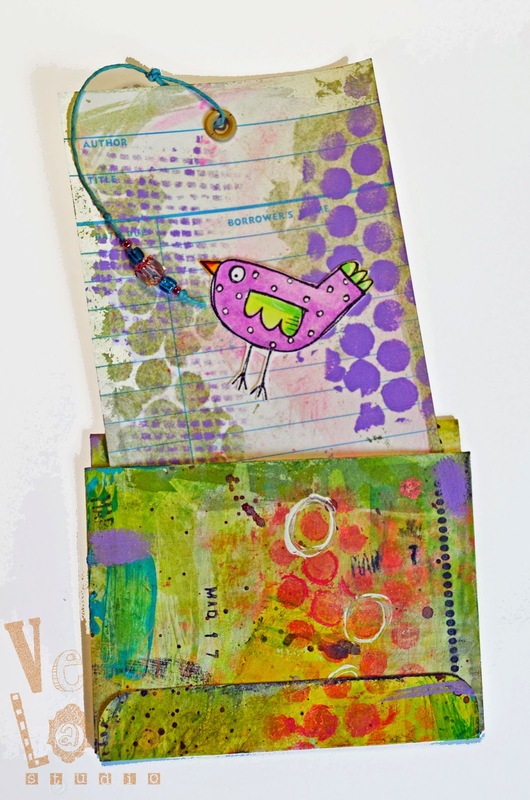 I had a small pile of gelli prints that I had created with acrylic paints, stencils and scraps. I loved the transparency of the paper and thought it would be fun to pleat and stitch. I first pleated the print then stitched on my sewing machine. I altered the stitch length and stitched a scribble formation. The weight of the folded and stitched print created a wonderful background for some Stampotique stamps. On a piece of muslin I stamped create . It was trimmed and stitched on contrasting paper. Hung out to dry was stamped and embossed. I painted the bunny using a waterbrush with Gelatos. She hangs on a snippet of waxed floss. 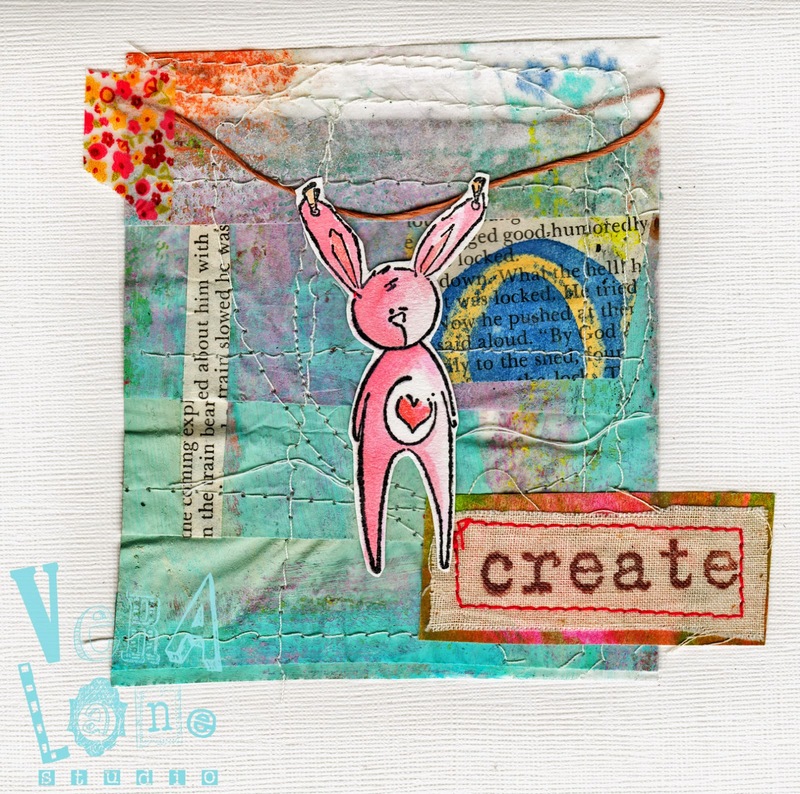 A small piece of washi tape picks up the colors that are behind the create image. This piece is so random but I love the experiment and texture play. Hope it gives you the idea to print and stitch. 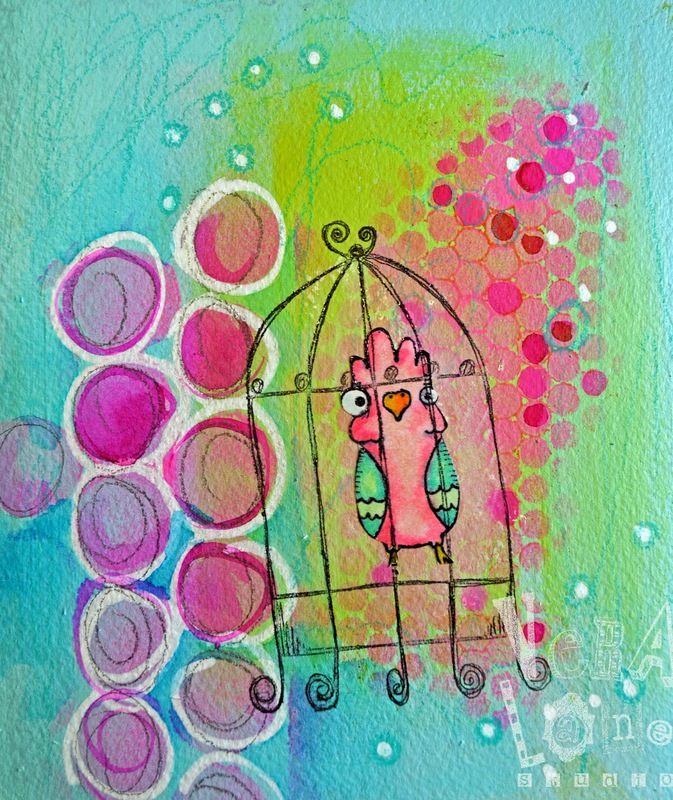 Bird in a cage is a loose lined drawing that lends itself to a free and funky journal page. The style matches a scribble technique and fits well with doodles and line work. My journal page came together with a gesso base, white acrylic, stencils, and pencil scribbles. I had sprayed Dylusion inks on patterned papers and incorporated them on the page. I was so feeling this quote this week so that became a secondary focal point of my page. I cut the openings on the bird cage with an x-acto knife to allow the background peep through. 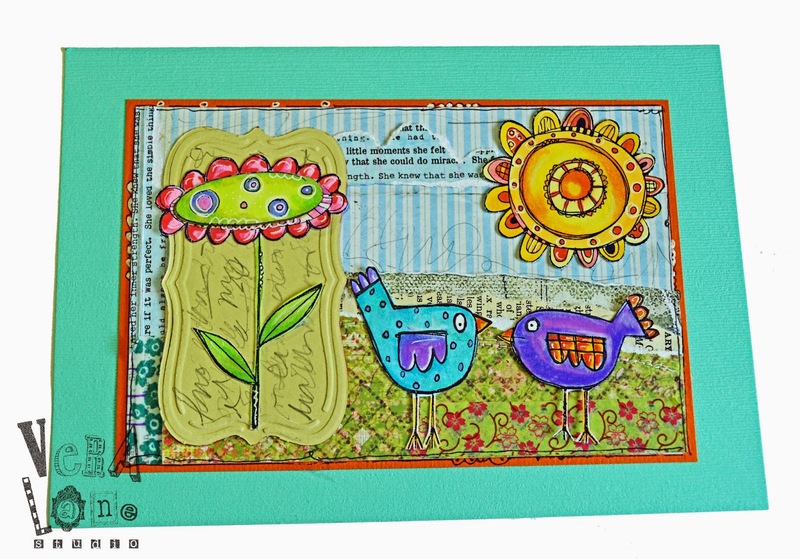 Bird in a cage is raised with a silicone adhesive dot to create a shadow on the page. What a week it has been. But I'm strong enough. I know it! Look out! It's the kitty squad! New release Kitty Squad by Kira Nichols features a foursome of silly kitties that can get themselves into plenty of mischief. Also new are Daniel Torrente's calendar squares. These squares make perfect windows for the squad to peep out of. Square widows were centered and stamped. An X-acto knife and cutting mat were used to cut window openings. 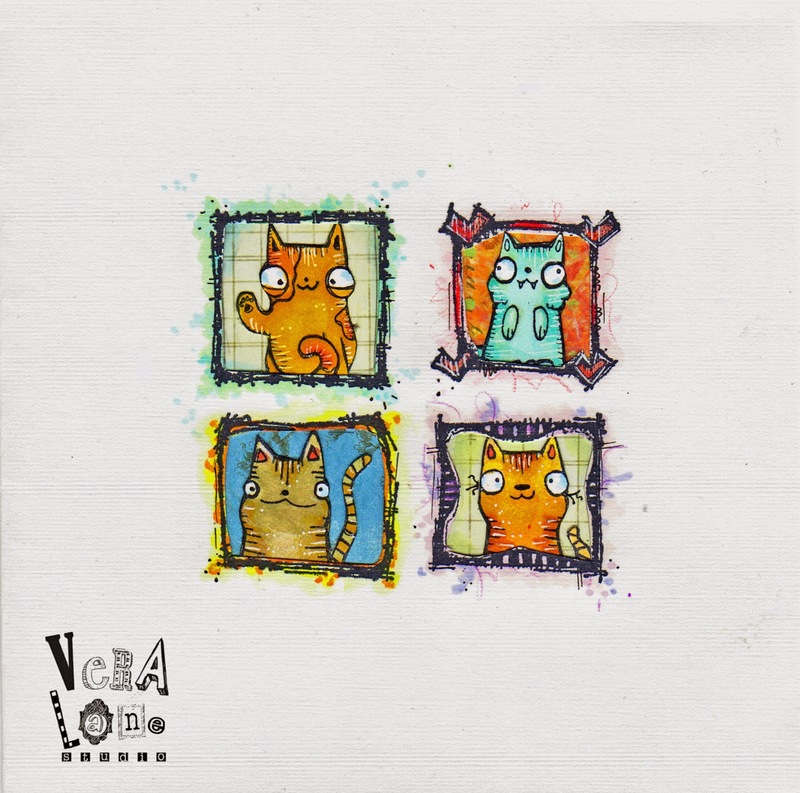 Kitties were stamped, cut and then colored with Copic markers with white Gelly Roll pen accent. Kitties have contrasting papers behind them to cover background of each window. Card is lined to obscure the paper inserts. I used Copics to create a faux splatter watercolor effect around the squares.